Bellapais Monastery Village is a sumptuous hotel situated at the fundament of Five Finger Mountain chain. 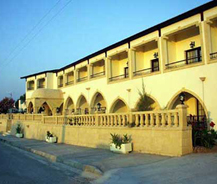 It is in the vicinity of Bellapais Abbey under the majestic view of the harbor and the historical town of Kyrenia. This establishment is about 2 miles from the town of Kyrenia, within a walk able range from Bellapais Abbey and village. You will surely come across the traditional and genuine Cypriot life style. Bellapais Monastery Village is a huge hotel consisting about 60 rooms. According your budget you will be provided with different mini villas, rooms with balcony, special suites. But the charm of this place remains fantabulous. All the rooms are provided with number of latest installations which would comfort you to an extreme degree. Rooms are provided with comforts like dial telephone, TV, shower, mini bar. But still the real essence of the place is held by the beauty and peace bestowed by the nature here. The hospitality and friendliness of the outstanding staff will make you feel like home. And it would pay off the money you spend to reclaim the serenity and the peace of mind that you have lost in you busy routine life. It's worth spending your valuable time here.